Photography is now more accessible than ever. You can document your life on the go with just a tap on a smartphone screen or a quick snap on a digital camera. Whether it’s treasured photos of your children, your latest holiday snaps or pictures from a wedding, the advent of smartphone photography has made it incredibly easy to capture the moments that matter to you. But have you ever wondered what would happen to your precious photos if the technology failed or there was a data loss? It’s no longer the norm to print photos. More and more of our photos are stored only digitally on phones and computers. And while our technology usually works fine, one tech catastrophe can wipe out your entire photo collection if you haven’t taken the right precautions. Mark Lord Photography has put together the following series of infographics that look the changing nature of photography, along with some helpful tips on how to make sure your photos are safe for years to come. Let’s take a look. The rise of smartphones has contributed to an exponential growth in the number of photos being taken. In 1990, around 57 billion photos were taken. While this number rose significantly to 86 billion in 2000, growth skyrocketed in the new millenium when smartphones and affordable digital cameras were introduced to the market. 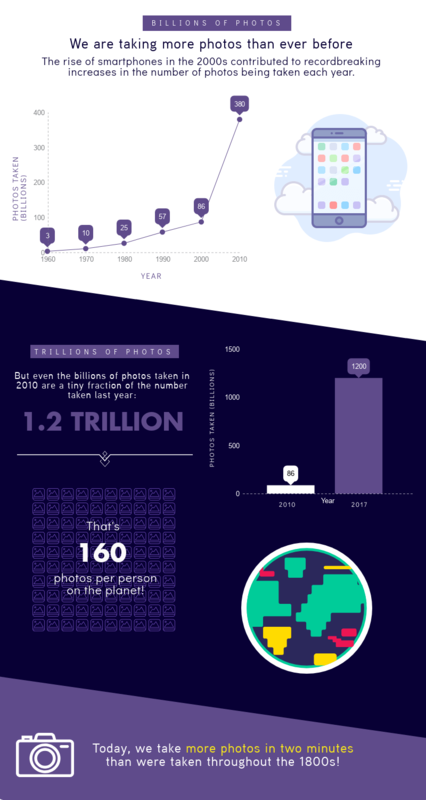 In 2010, 380 billion photos were snapped. And by 2017 this number rose to 1.2 trillion – a 1295% percent increase in just seven years. Amazingly, we now take more photos in just two minutes than were taken throughout the entirety of the 1800s, when photography first emerged. Cameras were once an expensive luxury, but the widespread availability of advanced smartphones with increasingly powerful cameras has changed that. It’s incredibly easy to take out your phone and get a quick snap. So it’s no surprise that 85% of all photos are now taken on phones, with more traditional digital cameras only being used 10% of the time. This may be part of the problem. You usually need to develop the photos from a camera, or at least upload them to your computer and sort them. But with phones it’s tempting to just leave your photos there, collecting virtual dust. Everyone is a little more casual with photos today. You can take photos whenever you like, so people are naturally taking more photos than ever before. But it doesn’t mean we’ve stopped taking photos of things we care about. In 1960, 55% of all photos taken were of babies. And today 67% of parents still photograph their children weekly. Technology hasn’t completely changed what we want to photograph. Most photographs taken are still of families, friends, and special events. Despite the fact everyone’s supposedly gone selfie mad, only 32% of participants in a survey had taken one in the past two months, whereas 77% had taken pictures of friends and family. With digital storage getting cheaper and better all the time, people have ditched printing photos in favor of storing them digitally – on computers and phones, and in the cloud. In a recent survey, 69% of participants said they’d #most likely keep their pictures stored on phones and computers. This is compared to a measly 7% who reported that what they’d most likely do is print them off, and just 6% who said they regularly posted photos on social media. It seems this will continue to be the case. Older people tend to have more framed photos and albums around the home, while the number falls off for the younger generation. People over 55 have on average eight photo albums and 11 framed photos, whereas those aged 24-34 have just four albums and seven framed photos. This generational divide will probably become more pronounced as time goes on. Printing photos is clearly on the decrease. In an ideal world, the lack of physical copies wouldn’t be an issue. But technology isn’t immune to failure or human error. Nearly a third of people have already lost important videos and photos after losing a smartphone, and 113 phones are lost or stolen every minute around the world. Data loss poses a constant threat to your photo collections, which is why it’s vital to back them up – ideally in multiple places. Wondering what you can do to ensure your photos are preserved for posterity? Here are some top tips for keeping photos safe long beyond the life of your smartphone. Have a professional photoshoot: If you’re tired of taking your own photos, consider having some professional photos taken. You’ll get some lovely photos that you can treasure for a lifetime. Go old school: Print might not be as popular as it once was. But printing your most important photos is a good way to ensure you have got a physical backup if everything goes wrong with your data situation. Keep multiple backups: For the photos you care about the most, keep multiple backups – one on your phone, one in the cloud, and a physical print. This gives you several safeguards against catastrophic data loss. Make sure someone in your family knows how to access important photos: Sixteen percent of people believe that in 50 years their children and grandchildren won’t be able to access photos on computers, phones and social media. Giving your family instructions on how to find sentimental photos will save you and them a lot of stress. We hope you enjoyed this series of infographics. Feel free to leave a comment below, or share this post with your friends. Mark Lord Mark Lord is a photographer based in Oxfordshire in the UK. He specialises in pictures of people, including wedding photography, family portraits and business photography. He’s passionate about meeting people from different walks of life and capturing beautiful, natural photos of them.